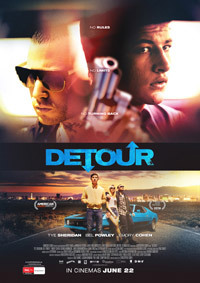 Detour is stylish new crime thriller that takes us on a trip through the seedy side of California and beyond. This sinister “Sliding Doors” follows over-privileged law student Harper (Tye Sheridan) who, after a drunken night finds out he may have mistakenly hired hitman Johnny Ray (Brooklyn’s Emory Cohen) to murder his stepfather Vincent (True Blood’s Stephen Moyer). Harper tries to renege but with no way out he embarks on a dark journey with Johnny and his partner in crime Cherry (Bel Powley). Thanks to Icon Films, we have 5 double in season passes to give away. It’s easy to enter, if you’re into nasty crime thrillers just email us at info@ciaomagazine.com.au and let us know you’d like to see this one, and we’ll let you know if you’ve won. Good luck!